By the late Victorian period most towns and villages had sports clubs and played competitive matches, which were reported in local newspapers. Football and cricket were the most popular team sports, but the scores suggest that strong skills were not always required for selection. One particular cricket match played in 1855 between Thurcaston and Anstey caused considerable excitement among the players, as it promised a leg of mutton supper afterwards. The superior bowling and batting of the Thurcaston team proved too much for their opponents and after each side had played one innings the score had reached the dizzying heights of Thurcaston 14 runs, Anstey 3 runs. The game was then abandoned due to lack of light. Not surprising really as the match was played on November 24th. Sport could be a great leveller and a way to build community spirit. The census returns of the period show that the members of some village teams came from all classes of society, from wealthy tenant farmers to humble agricultural labourers. Matches were played in fields loaned by friendly farmers. In the north of the county there was an annual “Vale of Belvoir Test Match” played by the villagers of Nether Broughton against the neighbouring village of Upper Broughton. Started in June 1948 as a direct result of a bet between two stalwarts of the district, Maurice Brooks of Nether Broughton and Jack Skinner of Old Dalby, it was played on a cricket square mowed in a field in Nether Broughton on the corner of Hecadeck Lane and what is now the A606, which even today proudly presents its rig’n’furrow for all to see. Far from being a problem, this was seen only as adding an interesting edge to the game! It certainly was a ‘game for all’ as some of the players were octogenarians, but if they couldn’t run fast, or indeed at all, they were allowed a younger man as a runner. The usual number of eleven men a side was given little consideration and often there were as many as eighteen men in each team resulting in a match that commenced at 11 a.m. and finished around 7 p.m. Each year the ‘Test Match’ was repeated and in 1950 even the BBC were interested and sent two reporters and a recording van. 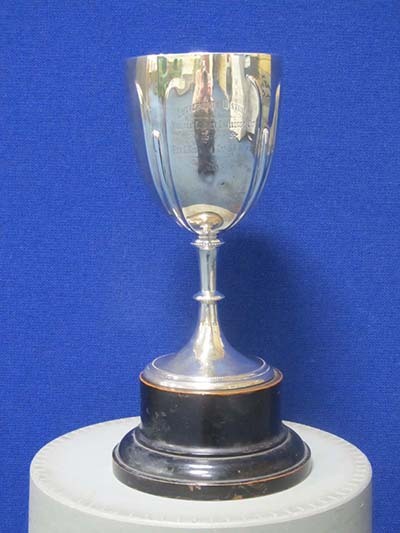 It was not until 1952 that there was a silver trophy to play for; this was given by Messrs Stapleford & Harding of Melton Mowbray. In 1954 the BBC once again visited Nether Broughton, which resulted in a broadcast two weeks later in the radio programme “Sports Round-up”. 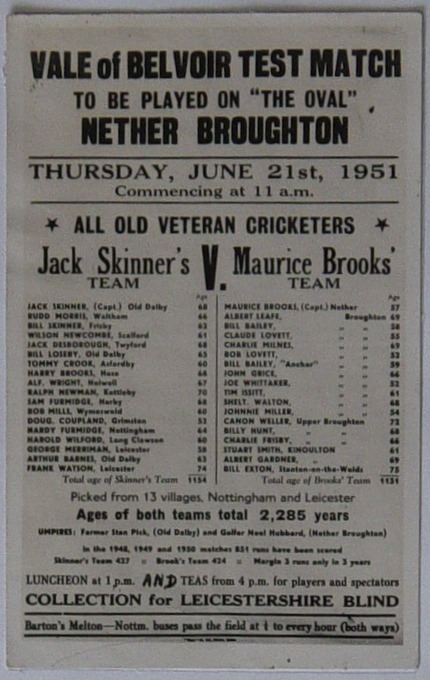 An attempt in 1956 to move this inter-village event to Egerton Park in Melton Mowbray was unsuccessful and in 1957 it was once again played at the Nether Broughton “Oval”. However ‘time and tide wait for no one’ as they say, and the last ‘Vale of Belvoir Test Match’ was played in 1963, as by now few of the original enthusiasts were still alive. Although, no doubt, seen by some as the end of an era, there was little sadness in the mind of Maurice Brooks, who had eventually won his bet. Sporting glory for Leire – but who is the man in the blazer? At the other end of the county, a local cricket competition was set up in 1903 by two public- and sport-minded gentlemen in south-west Leicestershire. Major Hugh Harry Robertson-Aikman was the lord of the manor of Dunton Bassett, a Justice of the Peace, member of the County Council and a retired captain of the Royal Dragoons. Reverend Christopher Rodwell was the rector of Kimcote and Walton and a rural dean. Together they inaugurated the Lutterworth District Village Cricket Challenge Cup, for teams from smaller villages that did not compete in the South Leicestershire league. The winners in 1904 were the team from Leire, and their victory was immortalised in a team photograph. They stare seriously at the camera, the cup balanced on the knee of Thomas Johnson, the senior player in the centre. On his left, Albert Spriggs, a wheelwright aged 39, looks stern, perhaps one of his four children is larking about behind the photographer. 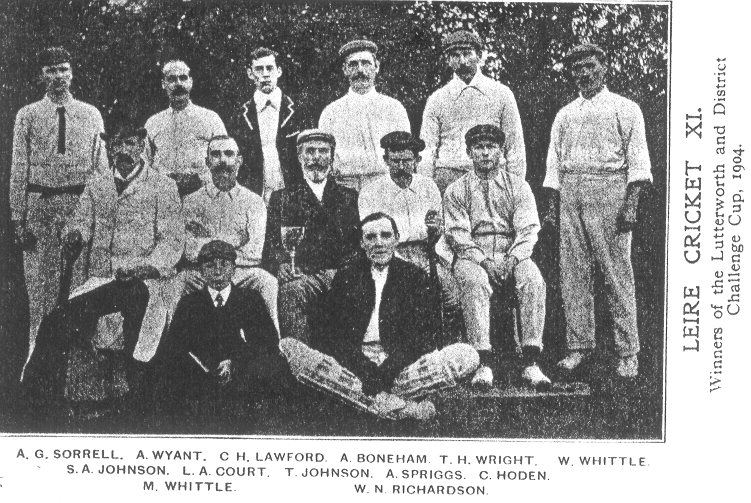 At the right end of the back row William Whittle rests, although one of the oldest members of the team, he is an opening batsman and also a first-choice bowler. His son, Maurice, 15, holds the score book containing the evidence of their victory. The team draws together all ages and occupations including three farmers, two innkeepers, a boot-maker, a builder’s son and a carpenter’s apprentice. Only one player sports a blazer, a mystery figure who does not appear in village records. Was he a talented visitor and the secret of their success? Do you know the identity of this mystery man? If so, we would love to hear from you via our contact form.